You gotta love San Francisco! 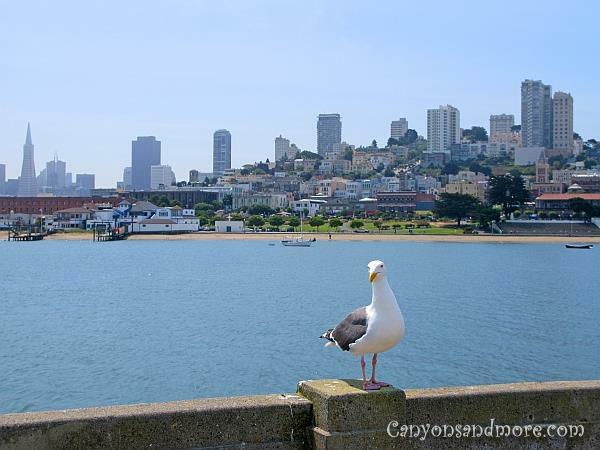 Typical sights in San Francisco are normally the Golden Gate Bridge, Fisherman’s Wharf, Alcatraz and cable cars. But after you visit the city, you will realize the city has so much more than all these things. After being there, it is also apparent what inspired the song, “I Left My Heart in San Francisco”. This city is simply unforgettable. If you take a boat ride to Alcatraz, you can also make great pictures of the skyline from the water like in the image above. It is interesting to find all of the landmarks. A great parking tip when visiting the city during the week is to park at the lot close to Fort Mason. It is about a 15 minute walk to the San Francisco Piers and at the same time, it does not cost anything to park there (during the week). On the weekend, during the week between 10 p.m. and 6 a.m. and on holidays, a permit is required. Otherwise, there are other alternative parking lots in the city where you can park for a fee. At the Fort Mason parking lot, you can also see the Golden Gate Bridge. Before reaching the piers, you will pass an old unused and unnamed bridge. Warnings advise the pedestrians that this bridge was not in good condition and caution should be used when walking on it. The bridge is worth going on to because it extends out into the bay and has a great view of Alcatraz and also of the city skyline. The bridge seems to also be a good hangout for fishermen trying to get a catch out of the Pacific. From the bridge, you have a wonderful view of the city as well. The walk to the piers takes you then through a park with some steep inclines and declines. A lot of bikers used this trail for training. The first pier you see is the Hyde Street Pier. It has a few attractions and shops that were worth looking at. Interesting are the different hands-on attractions showing how to create different fisherman’s knots. From the Hyde Street Pier you can walk back to Jefferson Street, which leads you further to the other piers. 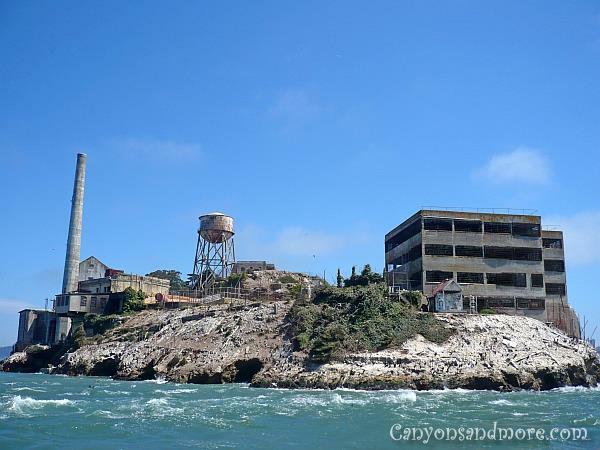 While walking towards the piers, you can make a stop along the way and take a boat tour to the famous Alcatraz Prison. This is a great way to see San Francisco from a distance. On the way back to the pier, you have a great view of the city from the water. 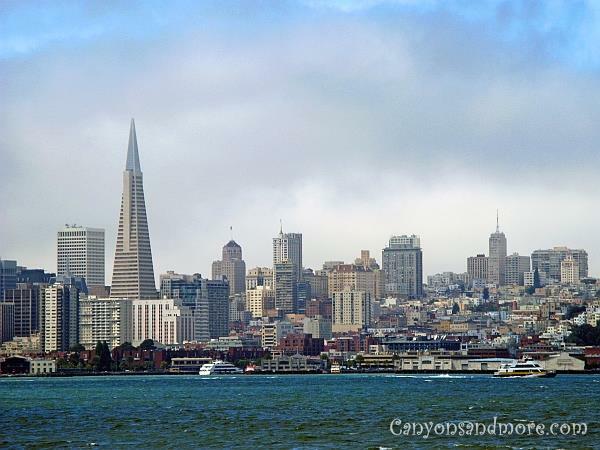 The Transamerica building is dominant in the skyline as well as the Coit Tower. Of course, the world famous icon of San Francisco, the Golden Gate Bridge is THE must see attraction of San Francisco. The best way to enjoy it is to park at either end and walk across it. Across the bridge away from the city is a parking area called Vista Point. From there you have a fantastic view of the bridge and can also enter onto the bridge to walk the entire length. There is plenty of room for both pedestrians and bicyclers. You may also park on the San Francisco side of the bridge at Fort Point. This historical location played an important role during the Civil War. From there you can see the skyline of the city and a great view over the San Francisco Bay. Summer in the city seems quite cool though. Even in July or August, it is wise to have a jacket as the winds can be quite strong on the bridge. Even more awesome are the frequent cloud formations engulfing the Golden Gate Bridge and the neverending hills. There are many possibilities to take pictures of the bridge from all sides and no matter which angle you choose, this bridge is simply gorgeous. 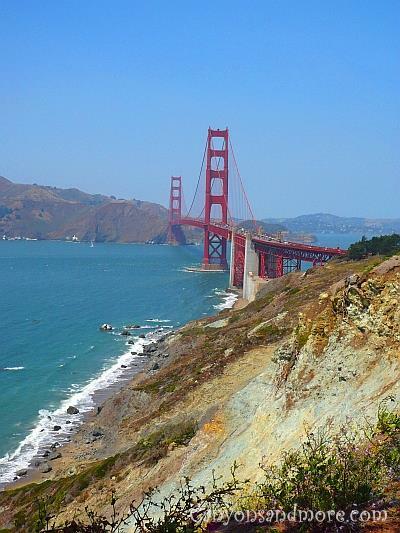 One great view of the bridge was can be found while driving towards Presidio in the direction of Golden Gate Park. Another aspect of the bridge can be achieved from the El Camino Del Mar. From there you can walk on a nature trail that takes you parallel to the bay and towards the bridge where you can make excellent pictures. One disturbing problem is to catch the bridge without the soup of clouds that always seem to be hanging over the city and bay. Treasure Island has a former naval base and also is a great stop for getting great pictures of the San Francisco skyline and of Alcatraz. The area is well kept but there was not too much going on, otherwise. Boats offer trips around the island of Alcatraz and under San Francisco’s Golden Gate Bridge for $15 per person for an hour’s ride. Even in the summer this can be a chilly and windy experience and be prepared to get a little wet. The first major attraction on the trip was travelling under the Golden Gate Bridge. Then you approach Alcatraz and make a complete trip around the island. The boat’s captain tells the story of the former prison, how life on the island was for the prisoners and the guards with their families. You should reserve tickets in advance as they are often sold out 7-10 days ahead. If you have no reservations, there also tours available which only enabled you to encircle the island and see it from the water. 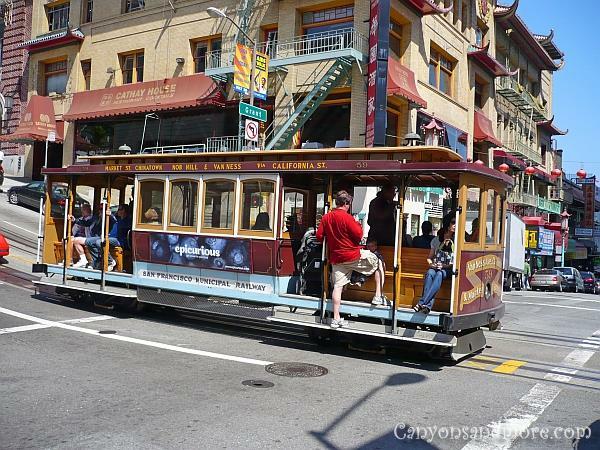 For $5.00 per trip (it could be more expensive now), you can enjoy a piece of San Francisco history - a trip on a cable car. These really came in handy, especially because a lot of our destinations were up many of the hills. We hopped on at one of the trolley stops in the city, informed the conductor were were heading and he collected his fair. 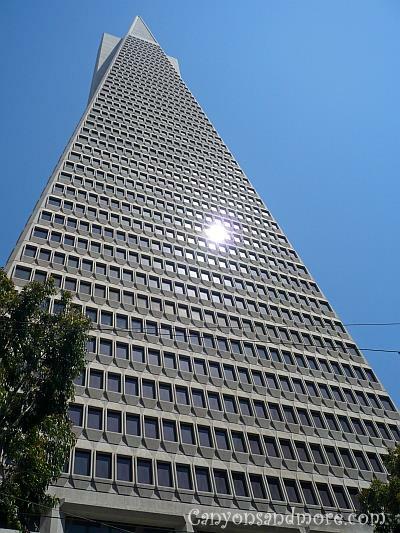 The Transamerica Pyramid defines the San Francisco skyline and is supposingly the 100th highest building of the world. 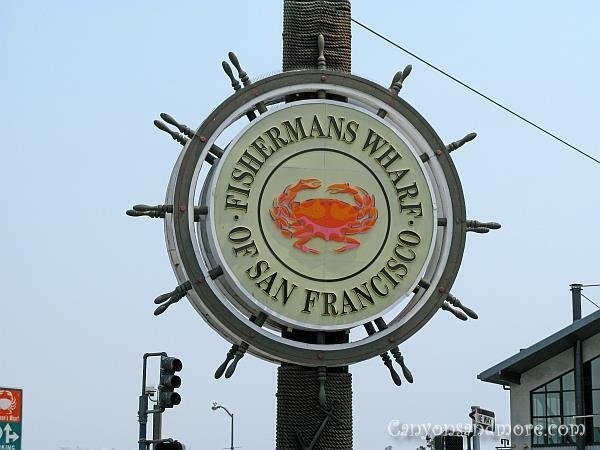 Fisherman’s Wharf... This is the place to go if you are into fish specialties. With plenty of restaraunts and locations along the wharf to visit, your taste buds will definately find a treat. If you are interested in history, the Jeremiah O’Brian naval ship and the S.S. Pampantino submarine are docked at the backside of the wharf. For a fee, you can enter each of them. Forbe’s Island is an attraction you will notice if you walk from Fisherman’s Wharf towards Pier 39. It is not hard to miss because of the lighthouse. It is decorated like a pirate’s cove and seems to be a restaraunt. 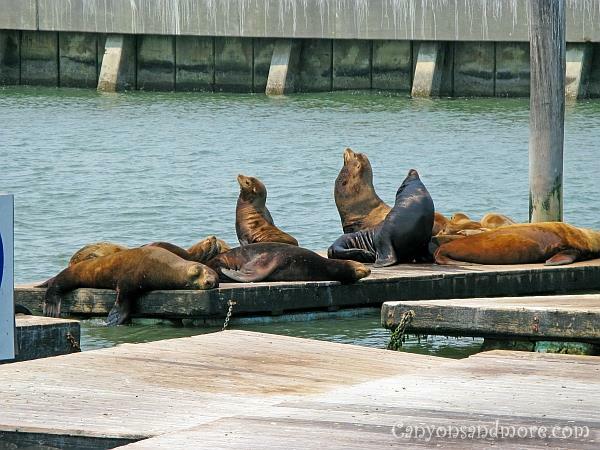 The first attraction at Pier 39 are the famous sea lions. The sea lions have found their own special place in the harbour of San Francisco and in the hearts of the tourists visiting the city. The whole pier is an attraction full of shops, restaurants, shows and rides for the kids. It is a really fun way to spend an afternoon in San Francisco. Inside the complex offers a variety of things to do and see. Restaurants serving fish specialties and clam chowder will keep the hungry satisfied, specialty shops will guarantee that you find that perfect souvenir to take home. Shows such as a Captain Jack Sparrow show will keep the kids and their parents entertained and happy for a while. San Francisco is famous for its hills and a challenge for pedestrians, bikes and cars. 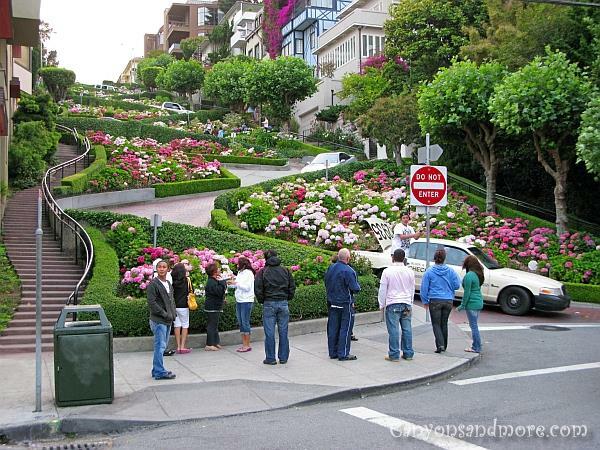 Probably the most famous hill in the city is Lombard Street. This is an attraction in itself and is known for its steep decline and sharp curves through an attractive residential area. Tourists were waiting at the bottom to photograph the drivers coming down. Some hills are so steep and often you hear squelching breaks of people trying to stop at the bottom of a hill. 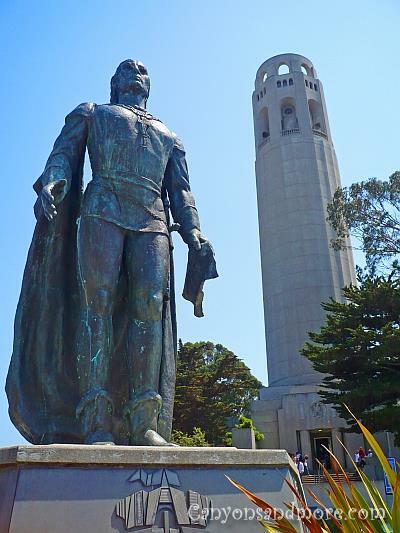 To see San Francisco and the bay from above, Coit Tower on the top of Telegraph Hilll, is a perfect location. For a fee, there are elevators that take you up and there is no time limit on how long you can stay. It is quite a steep walk up to the Coit Tower and there are possibilities to park at the tower if you wish to take your car. The hills are a challenge for walking and driving but make the city unique. Walk around the city and notice the charm of the homes here. Where as some buildings are of an ornate Victorian style, others are refreshingly modern looking pastel colored domiciles. From the top of Coit Tower there are windows facing all 360° so you can really get great photos of San Francisco from above.